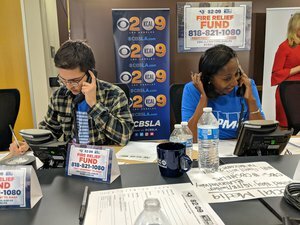 When KPMG employee Keywanne Hawkins heard about last Wednesday’s Fire Relief Fundraiser, her response was “Of course I’ll come.” Within 24 hours, she was taking calls for donations to United Way’s Southern California Disaster Relief Fund. As Keywanne heard stories and gathered pledges, she was blown away by the generosity she saw from people in all walks of life. She recalls three callers who encouraged her the most. The first was a woman who had been waiting on the line for 20 minutes to donate $5. The woman started by saying, “I’m so sorry. I don’t have a lot, but I hope this helps.” Keywanne was touched by the time that the woman had dedicated to give whatever she could. “It speaks to the human nature,” says Keywanne. “This is LA...you don’t [associate it with] generosity and caring and giving.” And yet here it was right in front of her. The largest contribution Keywanne recorded was $500, from a happy caller who was enjoying her evening. Keywanne recalls the woman saying “I’m grateful for what you do that makes me look good,” and Keywanne responded, “No it’s actually you who makes me look good.” Keywanne smiles thinking about their gratitude for each other’s contribution. Keywanne also recalls a woman who had been waiting to go to bed until she was able to get on the line to make her pledge. The woman felt bad that she couldn’t give more than $25, but Keywanne wants to assure people that $25 can make the difference for someone. To Keywanne and all those who give their time and resources to help our most vulnerable neighbors, we at United Way of Greater Los Angeles extend our greatest thanks.